Vancouver, British Columbia, June 29, 2018 – New Destiny Mining Corp. (“New Destiny” or the “Company”) (TSX-V Symbol: NED) is pleased to announce that it has entered into an exclusivity agreement (the “Exclusivity Agreement”) with an arm’s length private party (the “Claim Holder”) whereby New Destiny will have up to 30 days to conduct due diligence on certain mineral claims in British Columbia (“Treasure Mountain West”), with a view to negotiating the terms of a letter of intent and, if applicable, a definitive agreement in order to complete the acquisition of certain of the Claim Holder’s mineral claims (the “Proposed Transaction”). 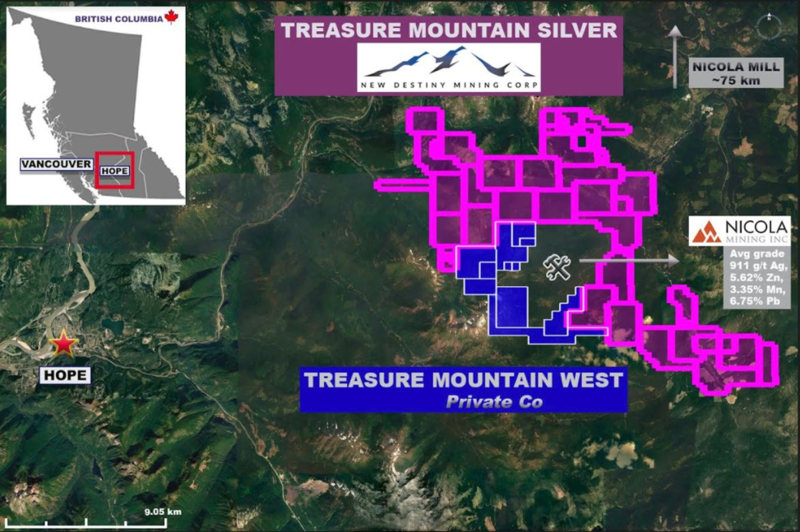 The Treasure Mountain West exclusivity agreement provides the opportunity for New Destiny to consolidate a major land position surrounding the Treasure Mountain past producer owned by Nicola Mining. With the exception of the Nicola Mining Property, New Destiny would be in a position to control the entire Treasure Mountain camp. The exclusivity property contains seven (7) known Pb-Zn-Ag+/-Cu, Au, Sb mineral occurrences including three (3) polymetallic vein occurrences with reported high grade Pb, Zn and Ag (Indiana, Summit and Morning Star). The polymetallic Summit Vein, located west of Treasure Mountain, exhibits the most significant potential. Numerous historic (1988) samples along an approximate 315 meter long trench at this vein were reported to return high grade Ag, Pb and Zn. Reported highlights of the 1988 channel sampling of the Summit Vein include 2,538 g/t Ag, 38.2% Pb, and 3.1% Zn over 1.78 meters; and 2,196 g/t Ag, 45.3% Pb and 7.5% Zn over 1.20 meters. Given the strike and grade, the Summit zone provides a drill ready target. The approximate east-northeast trending Indiana Fault is reported to pass through the area of the Indiana and Summit veins. An historic (mid-1980s) sample at the Indiana Adit Portal was reported to return 288 g/t Ag, 11.3% Zn and 5.7% Pb. The Indiana Adit Portal is reported approximately 100 meters east of the Summit Trench. Northwest of the Treasure Mountain deposit are the Venus Silver and Morning Star occurrences that border a large Cu-Mo-Au soil geochemistry anomaly with a coincident aeromagnetic feature interpreted to define a copper-gold porphyry target. This target is located in the northern region of the Treasure Mountain West Project. The high-grade Pb-Zn-Ag mineralization that characterizes the camp are thought to be indicative of vein style mineralization peripheral to a larger metalliferous porphyry system. The identified porphyry target is the first indication that the intrusive feeding the known mineral occurrences may locally extend to surface. Soil samples collected within this porphyry target in 2015 locally exceeded 1,000 ppm Cu with a few samples exceeding 2,000 ppm Cu. Within the region, copper-gold porphyry systems have been identified. The most notable being the Copper Mountain mine located approximately 30 km east-southeast of the project. New Destiny will be undertaking a detailed field review in the coming weeks to verify the previous work and determine which of the targets are drill ready and those that may require additional work. 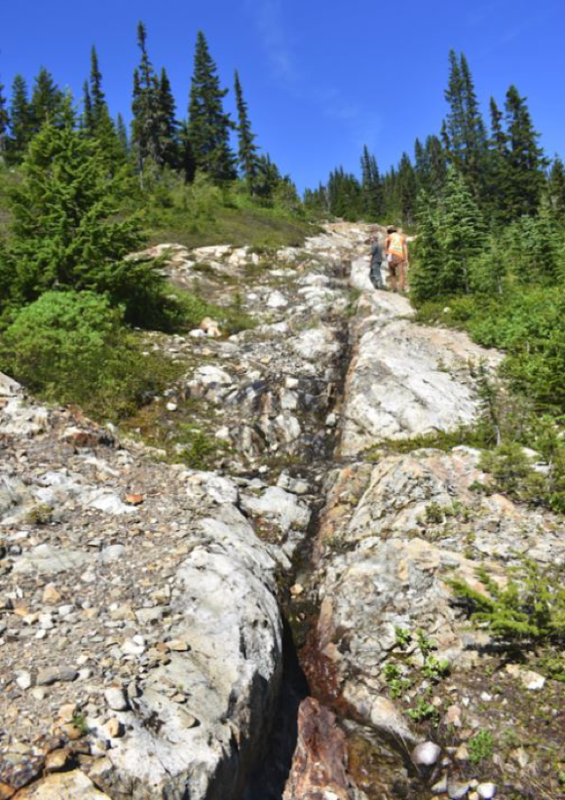 Preliminary review suggests a series of shallow holes along the high-grade Summit Vein are justified along with 5 or 6 exploratory holes within the limits of the defined porphyry target. New Destiny is excited by the additional potential this acquisition may bring and in particular the Cu-Au porphyry target previously unknown to the camp. Further details will be provided in a future news release if and when New Destiny and the Claim Holder execute a letter of intent in respect of the Proposed Transaction. For further information on New Destiny, please visit our website at www.newdestinymining.com, or contact Robert Birmingham, New Destiny’s President and Chief Executive Officer, at (604-488-3900). Readers are warned that historical records referred to in this News Release have been examined but not verified by a qualified person. Further work is required to verify that historical assays referred to in this News Release are accurate. This News Release may contain forward-looking statements including but not limited to comments regarding the acquisition of certain mineral claims. Forward-looking statements address future events and conditions and therefore involve inherent risks and uncertainties. Actual results may differ materially from those currently anticipated in such statements and New Destiny undertakes no obligation to update such statements, except as required by law. Forward-looking statements are based on the then-current expectations, beliefs, assumptions, estimates and forecasts about the business and the industry and markets in which the Company operates, including that: the current price of and demand for minerals being targeted by the Company will be sustained or will improve; the Company will be able to obtain required exploration licences and other permits; general business and economic conditions will not change in a material adverse manner; financing will be available if and when needed on reasonable terms; the Company will not experience any material accident; and the Company will be able to identify and acquire additional mineral interests on reasonable terms or at all. Forward-looking statements are not guarantees of future performance and involve risks, uncertainties and assumptions which are difficult to predict. Investors are cautioned that all forward-looking statements involve risks and uncertainties, including: that resource exploration and development is a speculative business; that environmental laws and regulations may become more onerous; that the Company may not be able to raise additional funds when necessary; fluctuations in currency exchange rates; fluctuating prices of commodities; operating hazards and risks; competition; potential inability to find suitable acquisition opportunities and/or complete the same; and other risks and uncertainties listed in the Company’s public filings. Factors that could cause actual results to differ materially from those in forward looking statements include continued availability of capital and financing and general economic, market or business conditions, the loss of key directors, employees, advisors or consultants, equipment failures, litigation, competition, fees charged by service providers and failure of counterparties to perform their contractual obligations. Investors are cautioned that forward-looking statements are not guarantees of future performance or events and, accordingly are cautioned not to put undue reliance on forward-looking statements due to the inherent uncertainty of such statements. These risks, as well as others, could cause actual results and events to vary significantly. Accordingly, readers should not place undue reliance on forward-looking statements and information, which are qualified in their entirety by this cautionary statement. There can be no assurance that forward-looking information, or the material factors or assumptions used to develop such forward-looking information, will prove to be accurate. The Company does not undertake any obligations to release publicly any revisions for updating any voluntary forward-looking statements, except as required by applicable securities law.